Going into Good Dinosaur all I heard about was too things- 1. It won’t be as great as Inside Out and 2. It was a nightmare to make. Going out of the film I didn’t care how hard it was to make and having had a totally different experience than Inside Out. Different but still good. I know it’s gotten some mixed reviews but for me I loved The Good Dinosaur!! It’s unlike anything Pixar has done before but I found it magical in the way old school Disney films used to be. This is a film like Bambi or Dumbo that are about the growth of a character and are artistically ambitious at the same time. I have seen it now twice, once alone and once with my nieces and both times I was dazzled by the Good Dinosaur. I worry that it may suffer the same fate as Rescuers Down Under. That film was about a journey of a child who is taken by a man and must find his way home with the help of Bianca and Bernard. It was technologically groundbreaking and something different from Disney but it had the misfortune of being couched between Little Mermaid and Beauty and the Beast so it is largely forgotten. Let’s not let that happen with Good Dinosaur folks! Go and see it. You are in for a real treat if you do! 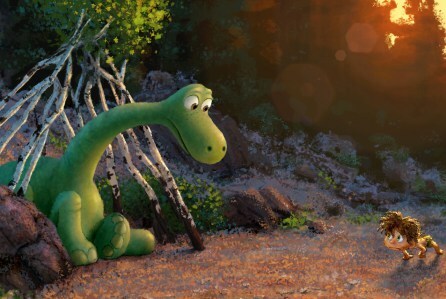 The Good Dinosaur is about a dinosaur named Arlo who is separated from his family after a tragedy occurs. He is a fearful creature who is even scared of a coop of chickens at the beginning of the film. In this world the asteroid misses Earth and so the dinosaurs evolve into subsistence farmers with corn crops and even a silo. Being fronteirsman it is essential Arlo learn to conquer his fears and his father tries to teach him this. But as I said a tragedy occurs and he ends up getting lost and having to find his way home. This is not a particularly new storytelling device but who cares? I certainly didn’t. The journey home is a favorite plotline of mine in movies or literature and as long as the characters are great and they do interesting things with it I’m on board. Arlo meets a little human boy named Spot who I really loved. He may be my new Baymax of favorite side characters. He is brave, but sweet and simple. His bond with Arlo grows bit-by-bit and felt like a believable friendship to me. And then they meet some raptors who are kind of like redneck poachers. Arlo and Spot also meet a family of T-rex longhorn ranchers stolen from a western film that I loved! I didn’t know if I liked their animation going into it but I did. They swap stories about their scars and the Pa Butch, voiced by Sam Elliottm teaches Arlo an important lesson about fear and how being afraid is part of knowing you’re alive. It’s going through the fear that makes all the difference. 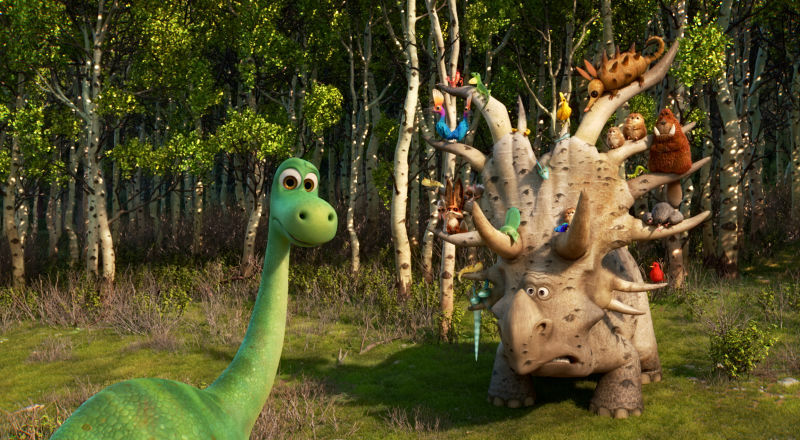 The Good Dinosaur is a different kind of film for Pixar. It’s a journey but it has the emotion you expect from Pixar. There is a terrific scene where both Arlo and Spot learn about each other’s family. This should make even the hardest person tear up! The animation in Good Dinosaur is the most stunning that Pixar has done. Yep, I realize what I just said but it is true. The water alone is hard to believe. It looks so real. There are many moments where you will swear it is real photographic backgrounds like in Dinosaur but it isn’t. I normally hate gifs but look at this! The only problem I had with Good Dinosaur is that it is pretty scary for small kids (kind of like Bambi, Pinocchio and early Disney films were). My niece is 6 and she had to be taken from the theater once because it was too scary. There are many moments of peril on Arlo and Spots journey. I mean the t-rex is the good guy if that tells you anything! That said, she still walked away enjoying the film and having nice things to say. She wished the tragedy hadn’t happened but still liked the movie. Just be forewarned small kids may be upset or scared in some sections but that’s not a reason to not see it. There are softer moments as well with Arlo and Spot bonding and some good laughs. I particularly like a scene with a dinosaur that carries around his ‘protection crew’. And like I said the scene with the t-rex family are completely lovely. The voice cast as usual with Pixar is outstanding Raymond Ochoa reminds me a little of the boy from Finding Nemo but a little more nuanced. Jack Bright is Spot, Sam Elliott is the T-rex Butch. Anna Paquin, AJ Buckley, Jeffrey Wright, Frances McDormand, Steve Zahn and others all do excellent work. I tweeted after seeing Good Dinosaur the first time ‘Another triumph for Pixar’ and I stand by that. Just in animation alone it is an astonishing film but it’s more than that. Director Pete Sohn has created a story that has it all. It’s moving, sweet, funny exciting and emotional. It’s interesting because inside a conventional story journey home they do unconventional things like the Western segments and the pterodactyles. I found it to be oddly unpredictable in its own way. Please go out and see it. I know you won’t regret it. Both times I saw it in the 3D which I recommend to get the full experience of the visuals. I will probably do a spoiler filled review next week like I did with Inside Out. If you get to see Good Dinosaur please put your experience in the comments. What a special time to be an animation fan! 2 great Pixar films in a year!! Happy day! But yeah, I hope I like it. Since you’ve compared it to ‘Bambi’, which is a film I appreciate and respect, but not necessarily like, I’m a bit hesitant. Yeah I have honestly no idea what you will think but I liked it a lot. I certainly dont think you will hate it. Nah, I don’t think I will hate it, but I feel I’ll rank it among the bottom tier of Pixar films. I have to let it sink in a little more before ranking. I certainly think it is better than Bug’s Life and Cars even though I like those films. It really did make me think of old school Disney films like Bambi which some might think is crazy but it did. I’m not seduced by any of the animation yet that I’ve seen, so I’ll think about seeing it in theaters. I just don’t like the feeling of paying for a movie then disliking it after, lol. Fair enough. It blew me away. You really aren’t impressed by that water? There were so many times in this film where you will swear it is photography. I’d just recommend seeing it in the theater if you can. I don’t know if they have a discount theater by you but that could be a good way to go. Even the people I know who didn’t like it were impressed by the visuals. Really, you think this film might be a disappointment like Rescuers Down Under and possibly forgotten because of that? I honestly doubt that considering pretty much most, if not all, of the Disney/Pixar films have performed well at the box office. Granted, Cars 2 might have fallen a little bit short of it’s budget, but still. Now, it might fall more along the lines of say A Bug’s Life and Ratatouille in terms of not doing as well at the box office, but I have faith if will do fairly well. I guess we’ll soon find out, eh? Anyway, glad to hear you have it an A. Hopefully, I’ll give it a similar grade once Insee it as well. Anyway, great review! Gotcha! Yeah, I can see how that could be the case. I mean the 2000 film Dinosaur did well at the box office, but has been forgotten. Likely in that case, that’s probably more understandable since it’s not as good. Many other Disney films (though I certainly prefer it to ones like Chicken Little and Home On The Range). Anyway, I hope this film is a Disney/Pixar films that leaves a legacy on the company and the audience overall as well. Finally got around to seeing ‘The Good Dinosaur’; I certainly really like it but I can’t say I put it in the Pixar A-list category. What I really loved about it was its Western style and aesthetic, and the combination of the lovely score and gorgeous animated landscapes really brought that up. And there’s a lot of Western tropes in the film. We have settlers trying to eke out a living in the wilderness with the Apatosaurus family, we have T-Rex cattle ranchers who canter across the plains with their arms bobbing up and down like cowboys riding upon horses, we have Pterosaurs and Raptors preying on the weak or stealing livestock just like bandits and rustlers, meaning that the Raptors’ thick Southern accents are not accidental. Spot even howls just like a wolf, so you could imagine this as a real life Western with a human boy adopting a wolf cub. All of these familiar elements work really well within the film’s context because sometimes the greatest antagonist in a Western is nature. Its like Old Yeller, there is no villain but there are the dangers that emerge from the outside world and there is no human or animal villain, its just nature. But they are all so freakin great! I’m amazed at how similar they are!! I didn’t think you’d lose ‘Monsters Inc.’ out of your top ten, though! Yeah it’s my 11. It’s just a question of nitpicking because I really do love Monsters Inc. I guess just Boo can be a bit ubercute sometimes but it’s a great film. (It was previously 10 on my list so it got the bump). Good point about the catch phrases but you are right. I hadn’t thought about that before. Glad you liked it even if it didn’t wow you. I’m sorry but I thought this was very disappointing. I saw it with my father today and he said the animation was amazing and had no end of compliments for it, but he thought the story wasn’t much to talk about at all. I agree. I should admit I didn’t find the premise too interesting in the first place (if dinosaurs hadn’t been wiped out, they’d still be here, duh!) but the best I can say is this is a very pleasant waste of time. It’s very nice and entertaining as you’re watching it, but as soon as you’re done I don’t think most people will be able to remember it at all. It’s in the same category as Brave, something wholly derivative and cliched that never realizes its full potential and will forever be stuffed in the dark corners of your cinematic memory. I have to admit I almost laughed out loud at the tragic death, as well, because I saw it coming so far away and then when it did come it was just completely out of nowhere as opposed to the plot-related reason we got in The Lion King that was built up for a long time. I did like the scene at the end where (SPOILER: we think he’s going to come back, but then we realize quickly that it’s not real). That was actually very powerful and I just wish that carried through to the heart of the film. I also liked the lesson that Arlo had to learn about being brave. Except that again The Lion King already did that last bit 21 years earlier. If it makes you feel any better at all, I will say this: Big Hero 6 was better. It just seems a bit “too little, too late” after films like The Land Before Time, Ice Age, and The Lion King, but I might see it again. It’s just especially disappointing when you see how much better Finding Nemo did with almost the same premise and how it made the tired “journey to find someone” plot seem refreshing and interesting. I suppose it’s all right to have a featherweight Pixar at the end of a year after what a heavyweight success Inside Out was earlier on. For me it was more like an old school Disney movie like Bambi and Dumbo. I found it refreshing after esoteric Inside Out to have something old fashioned. I actually dont think the Lion King or Finding Nemo comparisons hold weight for me. This is more of a classic heroes journey like in Bambi. If you think about Pinocchio the main point is for Pinocchio to learn to be honest and he faces challenges. This is the kind of story we get in Good Dinosaur. There are critics who genuinely like it that I could quote but my friend likes it even better than Inside Out. In the first act of this film, I was viewing it rather like Finding Nemo: while it wasn’t bad, it seemed to be aiming more at the younger audience and I couldn’t quite connect with it. As time went on, though, I got into it a lot more: I was invested in Arlo’s journey and personal development, and I could appreciate some of the subtleties like how Spot’s human problem-solving abilities compare to the dinosaurs. The T-Rex family were definitely a highlight. 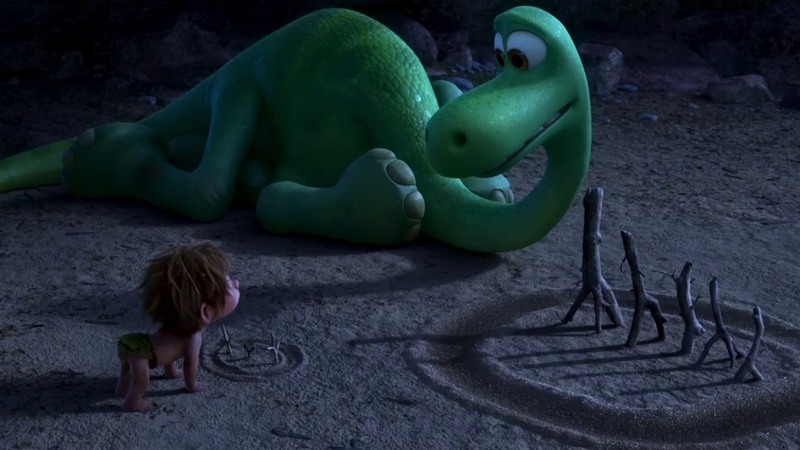 The “family” scene between Arlo and Spot was really effective – I didn’t cry, but I still appreciated it. And the visuals were phenomenal, with some of the environments being as close to real as I’ve seen in an animated film. Overall, I’d put it somewhere in the middle of my Pixar ranking. That makes total sense. I became more invested as it went along and it will also be in the middle for me. But that’s only because Pixar is so great. I finally got around to seeing this today. Honestly, I can see why you liked this film. I thought the idea of F-Rexes as cattle ranchers was clever, the live-action shots were awesome, the funny parts were also great, and things like that as well. It might feel a little similar to films like Brother Bear, Land Before Time, & Ice Age at times, but I’d say they probably go new with it. I walked out of the theater debating whether I liked this or Inside Out better. The last time I recall a similar situation like this was back in 2001 when I debated whether or not I liked Emperor’s New Groove or Atlantis better (which I concluded that I liked the latter better). This time around, I’d say I liked Inside Out better, but probably only barely or something like that. I’d probably go A- or A for this film as well. Oh, and I found myself getting teary-eyed at the end when SPOILER ALERT: Arlo ends up having tort Spot to back to his family. END OF SPOILERS. I also liked the alternate world overall about what it would have been like if the meteor hasn’t hit the earth and destroyed the dinosaurs in the end. Oh, and I liked how the film had the dinosaurs farming and things like that. Anyway, great review once again! Yay! That makes me so happy! I really think this is one where we will look back and sit baffled it wasn’t a bigger hit like we do Alice in Wonderland or Sleeping Beauty. I’m not saying it’s that good but still worthy of praise like they were. So glad you enjoyed it and thanks for checking in. That ending was so sad but it was the right thing for Spot. I hope they get to see each other from time to time. Yeah, me too! I just read that it only made $75 million domestically this weekend. I really hope it does better in order to make it close to it’s $200 million budget. I would hate to see this movie be a flop like say Tomorrow Land was or something like that. Granted Good Dinosaur is way better than Tomorrow Land, but you get my point. Oh, and I liked the Sanjay short film as well. I was shocked to hear that that film is mostly based on a true story. How often does one hear of that with animated short films? Anyway, glad to hear that you enjoyed this one too. I actually wrote my very first movie review on Facebook for this film. I of course mentioned mostly positive things about it, but still. Oh, and I liked the trailers for Zootopia and Finding Dory that played sometime before the film, along with most, if not all, of the trailers that played before Good Dinosaur. Just curious, did you also see trailers for say Daddy’s Home, Norm Of The North, Angry Birds Movie, or Alvin & The Chipmunks 4: The Road Chip? If so, what were your thoughts on any of those trailers or any other trailers that they might have shown? Would you feel comfortable sharing with me your facebook? I’d love to read your review. I can’t remember honestly what trailers played before either time I saw Good Dinosaur but I’ve seen all of those you mentioned but I’ve seen the trailers. My thoughts- Zootopia I’m not totally sold on yet but it will probably be fun, Finding Dory should be fun, Daddy’s Home could be awful but the trailer made me laugh, Norm of the North looks awful, Angry Birds doesn’t look like much there but it might be funny, Alvin and the Chipmunks I think looks awful- terrible trailer. Pingback: Secret Life of Pets Review – Reviewing All 54 Disney Animated Films And More! Pingback: Emoji Movie Review – Reviewing All 56 Disney Animated Films And More! Pingback: Pixar 40: Coco – Reviewing All 56 Disney Animated Films And More!